A mountain bike rider enjoyed the new ridge trail just below Gobbler’s Knob at Sun Mountain. 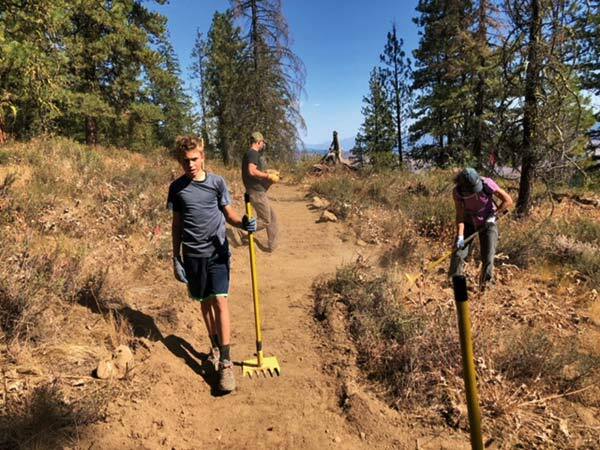 Local trail enthusiasts have given over 500 hours of volunteer labor this year to complete more than 7.5 miles of new trails on Sun Mountain, opening new terrain to mountain bikers and other trail users. Volunteers worked with professional trail builders to construct the new trails, which are part of a 22-mile expansion of single-track trails on Sun Mountain near Winthrop. The newly built trails include a portion of a trail along Thompson Ridge, reaching about 4,700 feet in elevation, where trail users are treated to sweeping views of the Methow Valley and surrounding mountains. The ridge trail, the centerpiece of the expanded trail system, will be 11 miles long when completed. 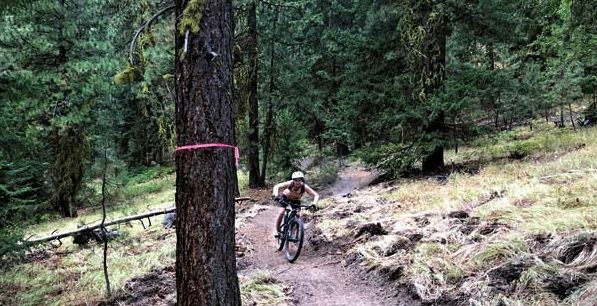 About 3 miles of the ridge trail were constructed this summer, said Joshua Gewirtz, president of the Methow Valley chapter of Evergreen Mountain Bike Alliance (EMBA), which is leading the trail project. Construction began in mid-May and more than 50 volunteers, including Methow Valley EMBA members and other trail supporters, donated labor to build the trail, despite the frequently smoky conditions this summer, Gewirtz said. “It shows the large community support” for the project, he said. The work of local volunteers was boosted by five professional trail builders from the state mountain bike alliance. “They trained us to do the same kind of quality work,” Gewirtz said. Work on the trail network will continue until the snow flies, and will resume next spring, he said. “Our main goal for the next building season would be to complete the ridge trail in its entirety. That is something I think we could accomplish by next summer,” Gewirtz said. A volunteer work party participated in building new trails at Sun Mountain. The project is part of a 22-mile extension of single-track trails. The 22 new miles of trails will connect to existing trails, giving Sun Mountain a total of about 35 miles of single-track mountain biking from Chickadee trailhead at the base to the ridge top. The trail system will provide a range of difficulty, for beginner to expert riders, Gewirtz said. The majority of the trails, about 70 percent, will be suited to beginner and intermediate riders, he said. Although led by the mountain bike alliance, the trails will serve different recreational users, including trail runners, hikers and horseback riders, Gewirtz said. “What we’re going for is an interconnected trail system built for a variety of users…and access to amazing terrain that is right out the door of Winthrop,” he said. Methow Valley EMBA has worked closely with the Methow Valley Ranger District in planning and carrying out the project. The Sun Mountain trail system is on U.S. Forest Service land, and the project required environmental evaluation and permitting from the Forest Service to move forward. The statewide EMBA has helped raise money for the project, which is the top priority project for the state organization. The trail work has cost almost $90,000 so far and will need about $140,000 more to complete over the next year or two, Gewirtz said. The Methow Valley chapter plans to seek donations in the October “Give Methow” fundraising campaign. The money spent by EMBA for the project is “a huge investment” in the public trails at Sun Mountain that has the potential to deliver significant economic benefits to the Methow Valley as a whole, Gewirtz said. The planned trail system has already gotten attention in the mountain biking community in publications like Free Hub magazine, and is likely to attract mountain bikers to the Methow Valley from around the United States and Canada, Gewirtz said. “I think it will be an attraction to people all over the country. 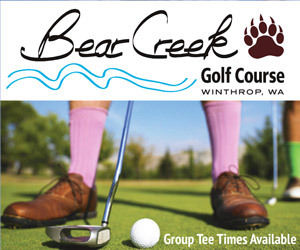 This will be an economic driver for Twisp and Winthrop,” he said. Gewirtz cited a recent study of the economic impacts of mountain biking in southwest British Columbia, which has become known as a mountain biking destination.